I have noticed for the last 6 months or so, at least here in Phoenix, that Amazon frequently does not deliver items when they promise. It is not just an issue with the shipper, in the last two cases the item did not even ship until 1-2 days after the date they promised for delivery. This has reached a head in the last week, when I ordered a number of items to be delivered immediately -- I am leaving town and wanted some items to take to my son's apartment. They are useless to me even a few hours after I depart home. I ordered seven items on Monday with my prime membership, and all promised delivery that same day (one for free, two with a nominal upcharge). Of these, none arrived on Monday. One arrived on Tuesday and as of 4PM on Tuesday, the other six have not even shipped, and Amazon is showing them here on Wednesday at best. I would not have bought these from Amazon had they given me accurate delivery estimates. I am wondering if they are using fake, overly optimistic delivery estimates to try to woo business from bricks and mortar stores, whose one advantage is immediate fulfillment. There has been a lot written about "chaos" in UK government and financial markets since the Brexit vote, so much so there are supposedly folks who voted for Brexit who want a do-over. Short term changes in financial asset prices, like bank stock prices or currency futures, are largely irrelevant in the long-term. The recent supposed "big drop" in US equities markets, for example, took the market all the way back to where it was in... March, barely 3 months ago. You will see buying in these assets in the coming days and the drop of the last few days will be largely forgotten soon. Financial markets don't react well to being surprised, but they will get over it. I don't see how the UK and the pound are necessarily weaker post-Brexit. The US is fine. The Swiss are fine. Heck, the Swiss have to constantly fight to keep their currency lower. Unlike other EU nations, the majority of UK trade is with non-UK nations. While trade with the EU will likely be on worse terms in the future (though the Swiss and Norwegians have pretty good deals), UK will be unshackled from the EU bureaucracy in negotiating new deals with the rest of the world. If the US President had any vision whatsoever, he would already have offered the UK a free trade deal, rather than being petty and saying the UK goes to the back of the line for exiting a transnational body the US would never join itself. Much of the "chaos" in British government can be traced 100% to the anti-Brexit folks. The Anti-Brexit folks very explicitly refused to craft any Brexit contingency plans, using threats of post-Brexit chaos to try to up the pressure against the Brexit vote. President Obama did the exact same thing with Obamacare, refusing to create contingency plans if the SCOTUS overturned key parts of the ACA, hoping to ratchet up pressure against that outcome. Had their been at least the outlines of a plan, they would be checking down it right now. Things I would do as PM on the trade front: 1. Demand the Swiss deal from the EU for Britain. 2. Approach major trading partners with offers of free trade deals. A British commonwealth free trade zone is a great idea. 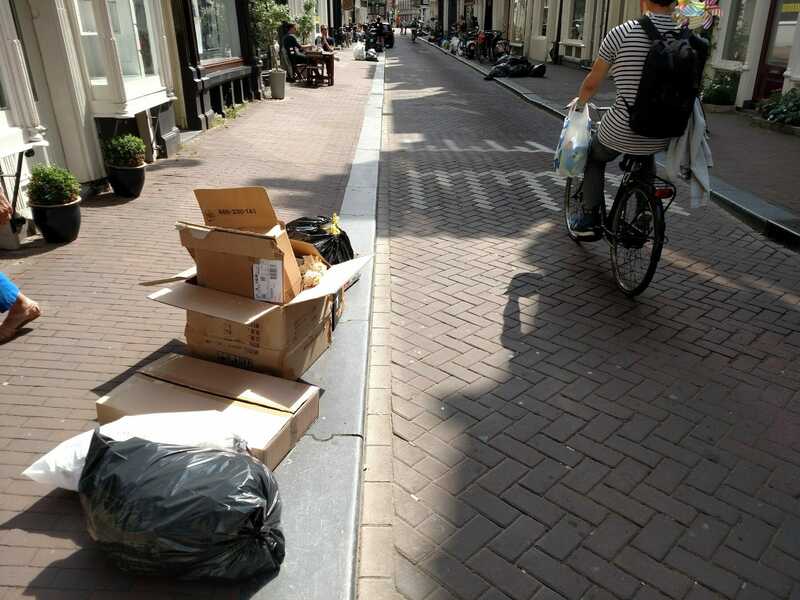 A Reliable Marker of Socialism: Politicians Accusing Private Individuals of "Hoarding"
When socialists destroy markets, shortages inevitably follow. The current situation in Venezuela is a great example, where just about everything from food to toilet paper has disappeared off store shelves. Rather than take a step back and say, "Wow, our policies sure have created a mess," socialists inevitably blame the shortages they created on private individuals. Nothing says "I am a socialist" like a politician denouncing their citizens for hording. Here is today's example from the state of New York. New York has totally screwed up its real estate markets by making it nearly impossible to build new housing and putting rent controls on the housing that exists. Which has inevitably led to shortages. Which is of course blamed by politicians on individuals who are "hoarding"
State Assemblywoman Linda Rosenthal, one of the [anti Airbnb] bill's sponsors, disagrees, claiming that it targets "people or companies with multiple listings. There are so many units held by commercial operators, not individual tenants. They are bad actors who horde multiple units, driving up the cost of housing around them and across the city." Was Brexit About Racism or Tea Kettles? Everyone on the Left is absolutely convinced that the Brexit vote was all about racism. In part, this is because this is the only way the Progressives know how to argue, the only approach to logic they are taught in college for political argumentation. Yes, as an immigration supporter, I am not thrilled with the immigration skepticism that dominates a lot of western politics. I struggle to cry "racism" though, as I confess that even I would be given pause at immigration of millions of folks from Muslim countries who hold a lot of extremely anti-liberal beliefs. Anyway, I would likely have voted for Brexit had I been in Britain. I think the EU is a bad idea for Britain on numerous fronts completely unrelated to immigration. The EU creates a near-dictatorship of unelected bureaucrats who seem to want to push the envelope on petty regulation. And even if this regulation were just "harmonizing" between countries, Britain would still lose out because it tends to be freer and more open to markets and commerce than many other European countries. The EU is poised to ban high-powered appliances such as kettles, toasters, hair-dryers within months of Britain’s referendum vote, despite senior officials admitting the plan has brought them “ridicule”. The European Commission plans to unveil long-delayed ‘ecodesign’ restrictions on small household appliances in the autumn. They are expected to ban the most energy-inefficient devices from sale in order to cut carbon emissions. The plans have been ready for many months, but were shelved for fear of undermining the referendum campaign if they were perceived as an assault on the British staples of tea and toast. A sales ban on high-powered vacuum cleaners and inefficient electric ovens in 2014 sparked a public outcry in Britain. Internet routers, hand-dryers, mobile phones and patio jet-washers are also being examined by commission experts as candidates for new ecodesign rules. As a free trade supporter, the downside would be the loss of a free trade zone with the rest of Europe, but I am not sure it can be called a "free trade zone" if they are banning toasters. Britain will negotiate new tariff rates with the EU, just as Switzerland and Norway (much smaller and less important trading partners) have done. The real crime from a US perspective is the actions of our President. Mr. Obama has told the British that by voting for Brexit, they go to "the back of the line" for trade negotiations with the US. This is, amongst a lot of stupid things politicians say, one of the stupidest I have ever heard. My response as president would have been to move Britain to the front of the line, offering them a free trade treaty with the US the day after the Brexit vote. Like most politicians, unfortunately, President Obama does not view trade as a vehicle for the enrichment of individuals but as a cudgel to enforce his whims in the foreign policy arena. Why on Earth has President Obama threatened to undermine America's strong interest in trading with the UK merely to punish the UK for not staying in the EU, a transnational body this country would certainly never join? As most of you know, my company operates parks on public lands, so I work with government agencies a lot. Years ago, from this experience, I coined a term called "arrogant ignorance." It comes from numerous times when government employees will be completely ignorant of some process, perhaps even their agency's own rules and procedures, but will fight to the death any suggestion that I might be able to enlighten them or that they are doing something wrong. For a while, people had me believing that I had just rediscovered the Dunning–Kruger effect. But I am now convinced that this is not the same as my "arrogant ignorance". And the difference between the two highlights a key point about failure of government I have made for years, which is that government does a bad job not because the people are bad, but because it hires good (or at least average) people who have terrible incentives and information. The Dunning–Kruger effect is a cognitive bias in which relatively unskilled persons suffer illusory superiority, mistakenly assessing their ability to be much higher than it really is. Dunning and Kruger attributed this bias to a metacognitive inability of the unskilled to recognize their own ineptitude and evaluate their own ability accurately. Like most people, I see Dunning-Kruger all the time. But I see it equally frequently in private and public settings. I don't think it is necessarily unique to the public sphere, and may be over-represented there only to the extent that it is much harder to eliminate under-performers from public rather than private jobs, so they may tend to concentrated more in public positions. Don't ever say yes to something (a project, a permit, a program, whatever) that later generates controversy, especially if this controversy gets the attention of your boss's boss. Don't ever do or support anything that would cause the agency's or department's budget to be cut or headcount to be reduced. You ever wonder why government agencies say no to everything and make it impossible to do new things? Its not necessarily ideology, it's their incentives. They get little or no credit for approving something that works out well, but the walls come crashing down on them if they approve something that generates controversy. So consider the situation of the young twenty-something woman across the desk from me at, say, the US Forest Service. She is probably reasonably bright, but has had absolutely no relevant training from the agency, because a bureaucracy will always prefer to allocate funds so that it has 50 untrained people rather than 40 well-trained people (maintaining headcount size will generally be prioritized over how well the organization performs on its mission). So here is a young person with no training, who is probably completely out of her element because she studied forestry or environment science and desperately wanted to count wolves but now finds herself dumped into a job dealing with contracts for recreation and having to work with -- for God sakes -- for-profit companies like mine. One program she has to manage is a moderately technical process for my paying my concession fees in-kind with maintenance services. She has no idea how to do this. So she takes her best guess from materials she has, but that guess is wrong. But she then sticks to that answer and proceeds to defend it like its the Alamo. I know the process backwards and forwards, have run national training sessions on it, have literally hundreds of contract-years of experience on it, but she refuses to acknowledge any suggestion I make that she may be wrong. I coined the term years ago "arrogant ignorance" for this behavior, and I see it all the time. But on deeper reflection, while it appears to be arrogance, what else could she do given her incentives? She can't admit she doesn't know or wasn't trained (see #2 and #4 above). She can't acknowledge that I might be able to help her (#4). Having given an answer, she can't change it (#1). You may think I am exaggerating -- how could people react so strongly to seemingly petty incentives. But they do. In my example above, this is probably her first job. The government is the only employer she has known. The confidence you might have to ignore these incentives to do the right thing likely come from jobs and experience that this woman has not had. I will give you a real example. One government contract manager asked us to spend $10,000 to do something, promising that the agency would reimburse me. I told her that I had never heard of this type of spending being reimbursable, but she said we would be reimbursed. So we did it. Later, her boss's boss heard about the reimbursement and said it was not correct under the rules. Eventually, our contract manager was challenged on it. You know what she said? She said our company spent the money without permission and that we were never promised reimbursement. She sacrificed her honor out of the fear of #1 and #3 - the incentives were that powerful for her. She knowingly lied and -- by the way - cost me personally $10,000 and a reprimand in our contract file. When I called her afterwards and asked her, "what the hell?" -- she apologized to me in tears and said she just would be in too much trouble once her boss's boss was involved to admit she had authorized the expense. So, I try to learn from this. One thing, for example, I always do is ask myself when someone who works for me screws up, "Is this really my fault, for not training them well." A surprising number of times, the answer is a reluctant, "yes". What's The Deal With the State of New York and Free Speech? Sorry, I am a bit late on this but it came out while I was out of the country. While the New York AG is going after ExxonMobil and a number of think tanks to try to prosecute them, or at least intimidate them, for their past speech on climate issues, apparently the state of New York is also going after college students who want to boycott Israel. I have never thought much of the BDS movement -- while like most western governments Israel certainly has its flaws, I find it bizarre that the BDS movement treats Israel like it's the worst government on Earth. In particular, I am amazed that BDS folks frequently, while they condemn Israel, act as apologists for neighboring Arab nations whose human rights records are objectively far worse. If a state institution is going to fund student groups, then it needs to do so in a viewpoint neutral manner. The only teeny tiny good part of this story is that perhaps a few campus Leftists who want to ban everything that they consider hate speech might have an epiphany that giving the government this sort of power is a bad idea, since one can never guarantee that one's own fellow travelers are going to be writing the hate speech definitions. 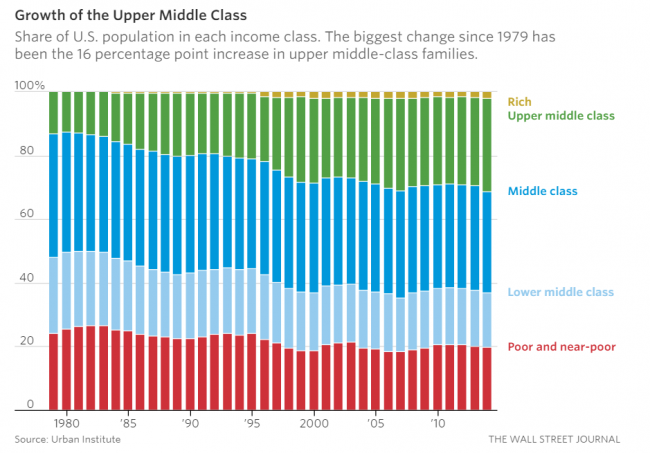 I have made this point before, but Tyler Cowen has a great chart from a new study. The explanation is here, but basically they have defined the bands based on some income break points corrected for family size and inflation over time. A reader sent me a nice note with this link, saying that I had been right many years ago when I began making this point. That's good, but I will also confess to be wrong on a related point -- I said 8 years ago that the one good thing about having a Democratic President was that the media would become much more positive suddenly about the economy. On that, I was wrong. The media still has a strong bias towards telling everyone that their life is getting ever worse, even when no such thing is true. A lot of folks, particularly on the Left, despise the Citizens United decision that said it was unconstitutional to limit third party political speech, particularly prior to an election (even if that speech was made by nasty old corporations). The case was specifically about whether the government could prevent the airing of a third-party produced and funded documentary about one of the candidates just before an election. The Supreme Court said that the government could not put in place such limits (ie "Congress shall make no law...") but Britain has no such restrictions so we can see exactly what we would get in such a regime. Is this what you want? As Britain gears up to vote in the EU referendum later this week, broadcasters are constantly working to ensure their coverage remains impartial. One such company is Sky, which has this week been forced to delay the latest instalment of John Oliver's Last Week Tonight HBO show. Why? Because it contains a 15-minute diatribe on why the UK should remain part of Europe. Instead of airing the programme after Game of Thrones on Sky Atlantic on Monday night, like it does usually, Sky has pushed it back until 10:10pm on Thursday, just after the polls close. Social media users are up in arms about the decision, but in reality, Sky appears to be playing everything by the book. Sky's decision allows it to adhere to Ofcom rules that come into effect during elections and referendums. "Sky have complied with the Ofcom broadcasting restrictions at times of elections and referendums that prohibit us showing this section of the programme at this moment in time. We will be able to show it once the polls close have closed on Thursday," a Sky spokesperson told Engadget. In March, the regulator warned broadcasters that they'd need to take care when covering May's local elections and the subsequent Brexit vote. Section Five (which focuses on Due Impartiality) and Section Six (covering Elections and Referendums) of Ofcom's Code contain guidelines that are designed stop companies like Sky from influencing the public vote. Satirical content is allowed on UK TV networks during these times, but Oliver's delivery is very much political opinion based on facts, rather than straight humour. By the way, the fact vs. satire distinction strikes me as particularly bizarre and arbitrary. When will folks realize that such speech limitations are crafted by politicians to cravenly protect themselves from criticism. Take that Citizens United decision. Hillary Clinton has perhaps been most vociferous in her opposition to it, saying that if President she will appoint Supreme Court judges that will overturn it. But note the specific Citizens United case was about whether a documentary critical of .... Hillary Clinton could be aired. So Clinton is campaigning that when she takes power, she will change the Constitution so that she personally cannot be criticized. And the sheeple on the Left nod and cheer as if shielding politicians from accountability is somehow "progressive." I would propose a free-trade agreement with the UK. No loss of sovereignty, no stupid EU regulations and bureaucrats, no restrictions on what can be called "sausage" -- just trade. I would offer a similar deal to anyone else who wanted to leave. Actually, when Obama visited, I would have been tempted to offer it to Britain at that time. Why was the US President so hell-bent on encouraging closer ties between Britain and Germany when he should have been working to improve the relationship between the UK and the US. But there's a dark side to all of this, which is what's going to happen to those communities when the sweatshops eventually close. In 1992, US Senator Tom Harkin proposed legislation that would block imports of goods produced by children under the age of 15. A year later, the Bangladesh garment industry dismissed 50,000 children in anticipation of the bill, which was never passed. A 1997 report by UNICEF tracked those children, and found that their situation had gotten worse, not better. As the report explains, the children wound up in "hazardous situations" where they were "paid less, or in prostitution." I was struck recently by a stark asymmetry in how the government values the time of private individuals. On the one hand, they insist on a high value for my time, with the state of California ruling that no one may sell their time for less than $15 an hour. On the other hand, in numerous ways, the government values our time at zero. They, for example, treat recycling as "free" and ignore the value of the millions of man-hours spent sorting trash. The IRS certainly values our time at zero, as does most tax agencies. Certain sales tax agencies do provide a collection and paperwork credit (since technically the business is acting as an agent of the state in collecting the tax) but that credit generally amounts to pennies per hour of labor. Mono County California changed their tax filing process in a way that created thousands of extra man hours of private filing labor all to save a few dozen of their hours every 3 years on audits. …the head of Germany’s Federal Environmental Office, Andreas Troge, says a speed limit of 120 km/h on motorways “costs nothing and would immediately reduce C02 emissions by 2.5 million tonnes per year”. That is it "costs nothing" as long as you value private individual's time at zero dollars an hour. Most folks know that labor costs in Europe are high, both because of high minimum wages, high required benefits, and various government regulations that raise the cost of labor (e.g. making it impossible to fire anyone). My observation so far is that private businesses understand this perfectly. Given higher labor costs than in the US, most service businesses have fewer employees. In restaurants in the US a waiter might cover 4-6 tables -- in most European restaurants I have been in the waiter covers the whole restaurant. In fact, two of the places we have eaten are 12 table restaurants run entirely by a couple, with one being the totality of the waitstaff and the other being the totality of the kitchen staff. In this case, the married owners of a small business might be hiring nobody. In Phoenix we all put our trash into standard cans which are a heck of a lot more attractive than basically just throwing garbage on the street. These cans are then emptied by a truck with just one employee, a driver that has an arm that reaches out and grabs each can and dumps it in the truck. 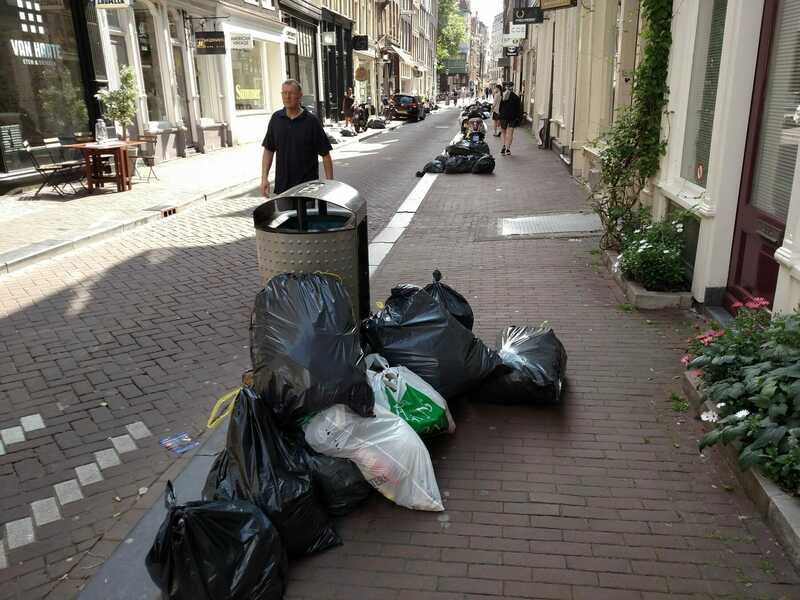 In Amterdam, trash is picked up far slower and requires three people, a driver and two guys running around like crazy picking up trash and throwing it in the back. 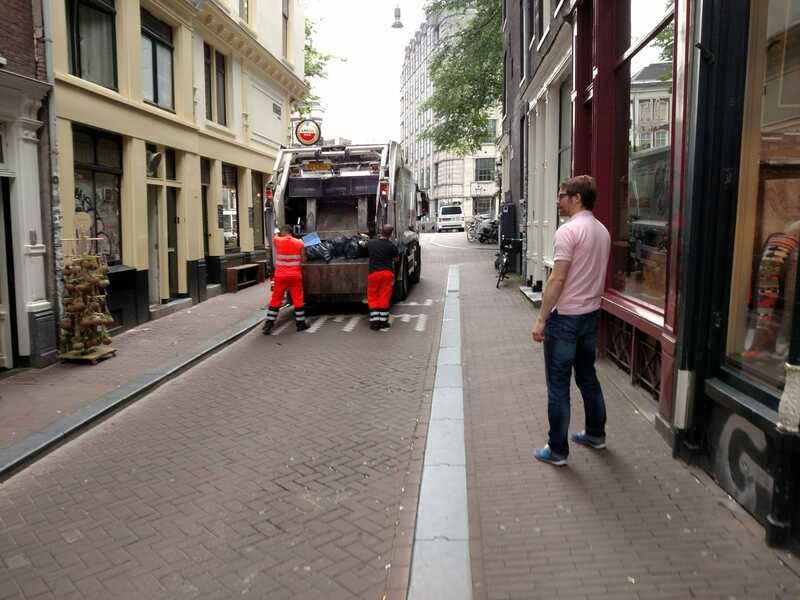 The compactor on this truck was terrible and slow and so the truck compactor could not keep up with the workers, who had to bend down and pick up the same trash two or three times to get it to stay in the truck. I might or might not get to it, depending on how I feel and how hard it turns out to be. I only have limited sympathy as your company placed those spam links on my site against my wishes and against the usage guidelines for the site and on posts that largely were irrelevant to your product. I had to go to considerable expense to move my server and add new software specifically to fight spam of the sort you were dumping on me. All I can say is that you reap what you sow. And as to your threats that my Google ranking is somehow in jeopardy due to your past behavior, I believe Google is fully aware of whether your site or my site should be penalized for such spam, and it is not going to be my site. If I do bother to remove the spam, I usually add an update to the post itself saying that "[company with link] has confessed to being unapologetic spammers in the past and a link to their site [and I include the link] has been moved from the comments section at their request and moved to the main post to give their bad past behavior more visibility." Bruges was a terrific little town, frozen in time about 400 years ago. After Bruges, Amsterdam was an unbelievable contrast. Despite being a tourist town, Bruges was quite quiet. Amsterdam is... frenetic. 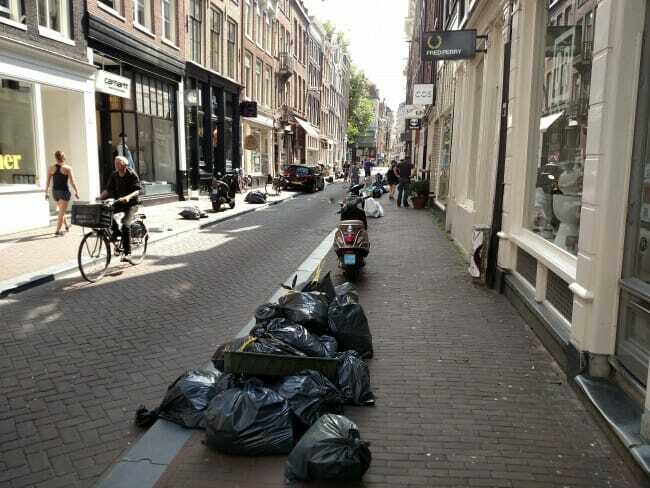 People have written many times about the bicycle thing in Amsterdam, but one does not really get a feel for it until it is actually experienced. Coming out of the train station there was a storage area with literally thousands of bikes. Bikes were everywhere. One had to watch every step to make sure one is not hit by a bike. Amsterdam has some kind of weird Logan's Run things going on -- zillions of people in the street, but they are all under 30. As a libertarian, I love that Amsterdam has legalized marijuana and prostitution. But as the only city in Europe that has effectively done so, it does create a problem in that it has become to Europe what Las Vegas is to the US. Its streets are full of bachelor parties and drunken college kids. The town has a lot of old-world splendor with its stately canal houses but it loses some of its charm as a visitor only casually interested in partaking of the debauchery. In Bloomberg, Megan McArdle gives me a nice link to my climate series that begins here. Some of you may wonder if I know about such things in advance. The answer is no. The only way I really knew was that I woke up in my little hotel in Bruges and fired up my email on my 300 baud hotel internet connection and found about 20 loooong emails wishing to discuss some aspects of climate in detail. Which I actually really enjoy, except that I was sort of unprepared for the deluge. I will get back to everyone in time. I do enjoy the feedback, and consider myself pretty persuadable on climate topics. PS- If you have not seen the movie "In Bruges", it is not particularly well-known but is a good film, imho.